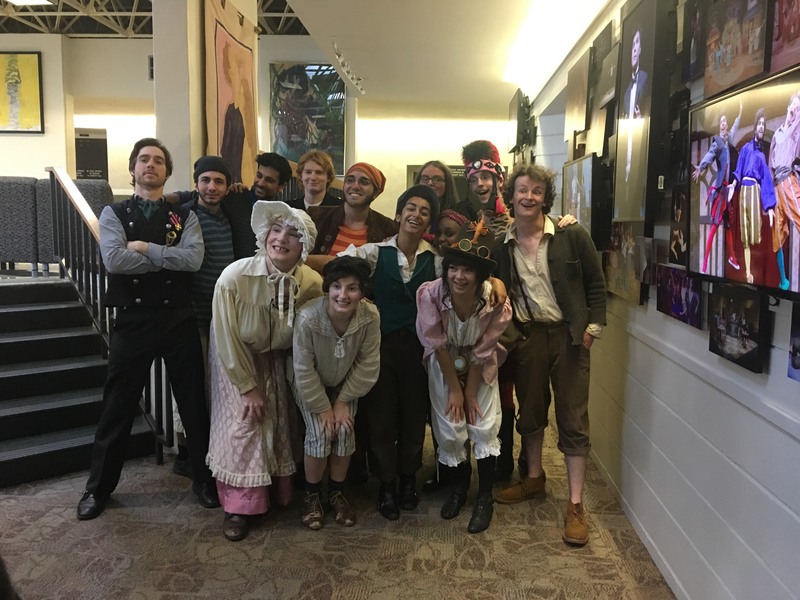 “Peter and the Starcatcher,” the background story for the famous and iconic story, Peter Pan, ended its two-week run at Seminole State on February 18 at Harriett’s Theater on the Sanford/Lake Mary campus. The next Seminole State College theater production will feature an all-female cast. “Measure for Measure by William Shakespeare” seems to mirror the recent events of the #MeToo movement, which is the spread of awareness for sexual harassment, especially in the workplace. The show is set to hit the stage April 6, 7, 12, 13 and 14 at 7:30 p.m., and April 8 and 15 at 2 p.m. Tickets went on sale March 19. The last event of the 2017-2018 Theater Season at Seminole State will be “Gotta Dance,” which will show April 27 and 28 at 7:30 p.m., and April 29 at 2 p.m. Tickets for “Gotta Dance” go on sale April 9. “Peter and the Starcatcher” is based on the original novel by Dave Barry and Ridley Pearson published in July 2004. It was first set to stage by Rick Elice in 2009. Peter and the Starcatcher tells the story of a young orphan boy who meets a young Starcatcher in-training, Molly Aster. Molly is set with the responsibility to deliver a precious cargo full of star stuff to Queen Victoria of England. When their ship is overthrown by the nasty pirate Black Stache and his men, Molly and Peter must join together in order to keep the star stuff out the wrong hands. The play is composed of two acts and what are called poor theatre terms, meaning the performers and crew used found objects, interchangeable roles and many theatrical devices, according to those in the Seminole State version. The head director, Jennifer Hart, is an associate professor at Hofstra University in Hempstead, New York. She’s credited with directing The Clean House, Little Shop of Horrors, Hospice, Much Ado about Nothing, and Dream of a Common Language. Seminole State’s own Ian Grey portrayed the boy of the hour. This was his second show at Seminole State. He has made appearances in 7 Second Itch, Picasso at the Lapin Agile, and The Complete Works of William Shakespeare (Abridged). Molly Aster, the Starcatcher that also happens to catch Peter’s eye, was played by Nikki Cuevas. She has experience with assisting the set construction for Roger & Hammerstein’s Cinderella, and directing the set department for Almost, Maine at Seminole High School in Sanford. When she found out that director Hart would attend the first show only, Cuevas said doing the other performances without her was slightly stressful. “If there’s any hiccups along the way, it’s not like we can ask her, ‘What can we do?’ because she’s in New York,” Cuevas said. Sophomore Lauren Calhoun, who portrayed Prentiss, added that they had the assistant director Athena Sarantis; Shannon Curran, the stage manager; and Celeste Portz, assistant stage manager, to keep them together if times ever got tough. After the show, Ian Grey mentioned that anyone can participate in the theater program here at Seminole State, even non-students. The cast encourages everyone to come out and see the shows, being that they’re free for students. Cuevas said they are always looking for artists, musicians, builders and people who can make costumes.